The Meraki MS is managed through an elegant, intuitive cloud interface, rather than a cryptic command line. To bring up a Meraki switch, just plug it in; there’s no need for complicated configuration files or even direct physical access to the switch. Meraki’s centralized management gives administrators deep visibility into the network and how it’s used. See which switches are near capacity across hundreds of sites. Find all configuration changes made by a certain person with instant search. 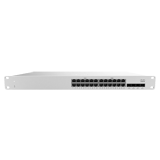 The Meraki switch family is designed to unify data, voice, and video onto a single IP backbone. All Meraki switches support rich qualityof-service (QoS) functionality for prioritizing data, voice, and video traffic. The switches support eight class-of-service (CoS) queues on every port, enabling them to maintain end-to-end traffic prioritization. PoE models provide power VoIP telephones, IP security cameras, wireless access points (APs), and other IP devices. In addition, using CDP and LLDP, PoE power is intelligently budgeted to maximize the number of PoE clients supported. For the most power-hungry applications, support for Cisco UPoE is also available. The Meraki MC products work flawlessly with Meraki switches, and create a unique and powerful experience to installing, supporting and troubleshooting VoIP technology. Meraki is the only switch to include integrated Layer 7 fingerprinting. Identify hundreds of applications from business apps to BitTorrent and YouTube. User fingerprinting with Google-like search allows administrators to easily identify and control individual users, PCs, iMacs, iPads, Androids, and other devices. This unprecedented visibility allows optimizing of network resources and maintaining optimal network performance. Meraki switches run the same Meraki operating system used by all of Meraki’s products. 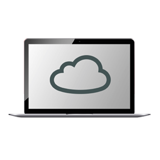 The use of a common operating system allows Meraki to deliver a consistent experience across all product lines. When connected, MS210 switches automatically connect to the Meraki cloud, download configuration, and join the appropriate network. If new firmware is required, this is retrieved by the switch and updated automatically. This ensures the network is kept up-todate with bug fixes, security updates, and new features.